The Eton system for furniture industries is a flexible material handling system designed to eliminate manual transportation and minimise handling. It increases productivity radically, ensures an optimal working flow and provides time for adding value to your products. Technically the system consists of overhead conveyors with individually addressable product carriers, automatically finding its way to the correct operation. It is monitored by a computer providing all necessary data for measuring and managing the process optimally. Furthermore, the system is highly flexible and can rapidly be modified to changes in the production line or the need for expansion. The Eton system transports all the pieces of one complete chair through the manufacturing process. An addressable product carrier takes all the pieces of one entire unit (i.e. for chairs – upholstery, covering, lining etc.) through the different steps of production. Operations are performed at individual workstations. The end result is a cost-efficient product, processed from pieces to completion. Load all the pieces in a product carrier. The product carrier with the pieces will be routed through the different operation steps. At every machine/operation the patented Eton chain will position the product ideally. Up on completion the product arrives to an unloading station. The empty product carrier returns to the loading station. Decreased work in process (WIP), improved space utilization, and increased productivity are but a few of the systems benefits. Due to less need for manual handling, improved lead times, improved ergonomics and substantially shorter though-put time, improvement in efficiency varies between 30-100%. This makes Eton systems one of the most a valuable investments for global enterprises. 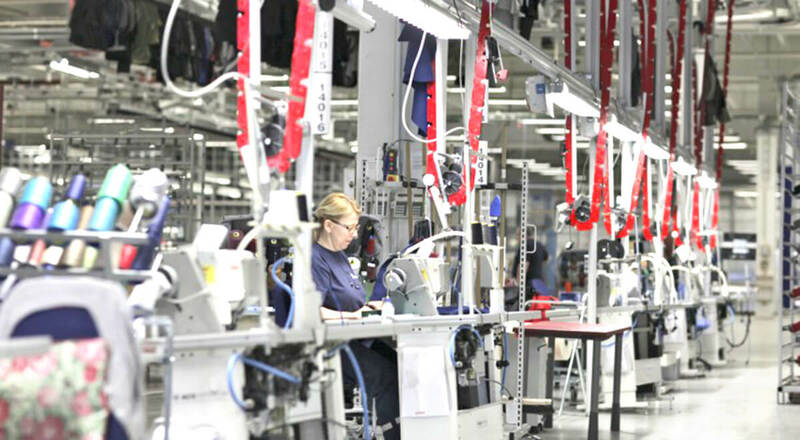 For more than 40 years Eton systems has improved production efficiency in various types of industries, all around the world. More than 4000 systems have been installed at the plants of big and small prestige customers in more than 60 countries in Europe, USA, South America and Asia. One size never really fits all and one solution does not fit all situations. No one understands this as well as we in the industry itself. That is why at Eton Systems, we do not think in terms of one-size-fits-all, we think in terms of custom-made solutions matched to specific customer needs. Our systems provide efficient solutions, perfectly suited to individual customer’s operations, requirements, and conditions. The Eton system is a totally flexible modular system. This makes it easy to change, expand and adapt to different kind of buildings and manufacturing processes. Adding additional workstations and/or buffer zones, is easy. The flexibility makes it ideal for step by step implementation today or for companies that want to be prepared for rapid expansion tomorrow. Multiple rails for sorting at workstations. Automatic loading devices, pick-ups and work delivery robots. Bridges and elevators that link systems and floors. History link to product after completion. A common statement within our worldwide user base is that the discipline the system provides has allowed them to utilize their existing recourses in a much better way. And not the least the Eton chain provides ergonomic benefits that directly translate less fatigued operators and improved productivity. We realize that any successful production or manufacturing process relies heavily on ergonomics and usability. That is why we put a great deal of emphasis on the human factor when implementing any Eton UPS solution, such as including extensive training for all employees that will be using the system. Enhancing production efficiency will not only have a substantial impact on profitability and improving cost efficiency. Also, our customers normally reach return on their investment within 1-3 years, depending on the art and complexity of their manufacturing. Due to this Eton system is ranked as the “Number one investment” by a Major University with a payback on implementation from 12-30 months on systems that will continue to produce and be profitable for the next 20-30 years. At Eton it is a well known fact that reliability is a key factor. Products and services provided by Eton are always top of the line, such as systems with minimum downtime, local support for easy and quick response and the latest training programs available in the market. With a very active R&D department and knowledge from more than 4000 system installations in more than 60 countries it is safe to say that Eton is a partner you can rely on! Reliability – downtime costs money – invest in good quality. Training – good training on every level is the key to a successful implementation. Support & future upgrades – select a reliable supplier with a track record of constantly improving products and supporting their customers. Flexibility – protect your investment by choosing a supplier with a modular approach that will allow your system to grow as your business grows, don’t get boxed in. Overall – invest in a system that will maximize your productivity and fit your needs today as well as tomorrow regardless of the direction your business, customers or products take. In addition, the Eton UPS method of transporting products on a suspended system keeps the factory floor clear and the workstations themselves free of everything, but the material specifically needed to carry out a particular operation. And since component pieces are brought directly to the machine and are then sent on automatically, the work process is ergonomically optimized. A smooth and consistent rhythm is achieved, providing improvements in both quality and efficiency. Experience shows that repetitive-motion injuries caused by bending, stretching, and reaching, so common in the industry, have been practically eliminated – unprecedented control all around! in workplaces where Eton UPS’s have been installed. The Eton handling methods are based on ergonomics, which is a key element in the design of the Eton system. Pain and injuries to shoulders, back and neck are common in this industry. With the Eton system, products can be positioned as close as one centimetre from the desired point. All the tiring reaching, bending, lifting and pulling of bundles and work-in-process is completely eliminated. As a result, operators experience less fatigue, fewer injuries, and less absenteeism. These results translate to benefits for both the operator and the manufacturer as: More job satisfaction, higher skill levels and therefore higher earnings for the operator. Higher attendances, more turnover, more productivity, lower training costs and lower medical expenses for the manufacturer. Self motivation of the operator using the continuous feed-back of information through the operator terminal regarding “pay”, performance and quality. Opportunity to pace your self. A more efficient work place layout. Workplace can be adapted to the operators needs.